Part of a comprehensive Quality Management System, FabriQDM and can be used standalone or in conjunction with the FabriVISION Laser. FabriQDM and FabriVISION utilize a centralized ICS file for full spectrum inspection coverage from blanking to assembly. 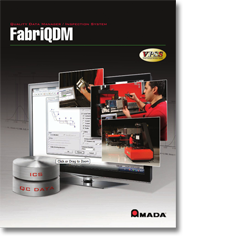 FabriQDM increases machine throughput, improves quality processing and expands your shop’s reach and service to clients.